Figure 2. 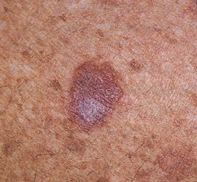 Skin biopsy showing a marked lymphocytic reaction under the epidermis associated with liquefaction degeneration of the basal layer and clefts. The epidermis showed no evident atypia. The patient had extensively sun damaged skin with numerous freckles and multiple larger, sharply demarcated and angulated solar lentigines (Figure 1). Over six weeks he had noticed that a pigmented lesion, measuring 0.8 cm in diameter, on his chest had become inflamed and developed a dusky red–brown colour (Figure 1). Bowen's disease represents a squamous cell carcinoma in situ and is often sharply demarcated and may appear hypertrophic and inflamed. Skin biopsy shows that the epidermis has been replaced by keratinocytes which demonstrate a highly disorganised architecture with nuclear atypia and mitoses. Seborrhoeic keratoses may have a flat, slightly papillomatous surface and are often sharply demarcated. Irritated seborrhoeic keratoses may be associated with surface scaling, crusting and erythema. Skin biopsy shows a papillomatous epidermis composed of small keratinocytes which enclose multiple, keratin-filled pseudocysts. Lichen planus usually presents as multiple, shiny, violaceous, polygonal papules which are pruritic. A white, lace-like, reticulate pattern on the buccal mucosa, scarring alopecia or nail loss may be an additional sign. The histopathology of lichen planus would be identical to that seen in this man’s biopsy. Lichenoid keratosis is the correct diagnosis and may be seen particularly in individuals with chronic sun damage and multiple solar lentigines. Excision biopsy showed a hypertrophic epidermis, under which there was a marked lymphocytic infiltrate. The basal layer of the epidermis showed extensive vacuolar degeneration that had produced clefts. The epidermis was well differentiated and the surface showed hyperkeratinisation and had a slightly papillomatous outline (Figure 2). One or more lentigines may become inflamed and develop a violaceous, dusky hue. The marked lymphocytic inflammation is due to a host immunological response which may eventually result in regression of the solar lentigo. Although lichenoid keratoses develop most frequently in solar lentigines, a similar reaction has also been seen in other primary lesions including actinic keratoses, Bowen's disease, other squamous cell carcinomas, malignant melanomas, benign naevi and warts. A skin biopsy or excision is required to identify the primary lesion. Rarely, individuals may develop multiple lichenoid keratoses. Solitary lichenoid keratoses may be impossible to distinguish histologically from lichen planus. No specific treatment is required for lichenoid keratoses, but multiple lesions may be helped by applying topical corticosteroid creams. Lichenoid keratoses represent a lymphocyte-mediated host response that targets solar lentigines but may also mask the presence of a malignancy, such as melanoma or squamous cell carcinoma. Careful analysis of the clinical features and biopsy may be required for a definite diagnosis. This article was first published in Modern Medicine of Australia in December 1997. It was reviewed and updated in July 2011.